We put green back into your bottom line and the environment. Being “green” isn't only about environmental stewardship – it's also usually good for your business (read Green Printing Is Good for the Bottom Line to learn more about this). Smarter use of paper. Automating business processes . Using printing rules to limit printing to only what is really needed. These are all steps that are environmentally friendly while improving your business' workflows, efficiency, and helping save money. To learn more about DatamaxGreen and our ideas and solutions for giving green back to the environment and getting green back in return, let’s visit! 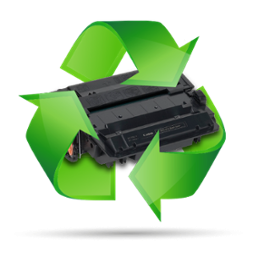 One of the simplest ways to go green is to recycle those toner cartridges rather than throw them away. We actively promote the use of our vendors' used toner cartridge recycling and collection programs. For specific details on recycling, click on the links below. If you have any questions, give us a call at 501-603-3000 and we'll answer any questions you have about recycling or provide additional assistance. A Fortune 500 company could save 800 tons of paper in a year by setting duplex printing as a default—at an annual savings of $7.7M. (Internal HP Case Study).